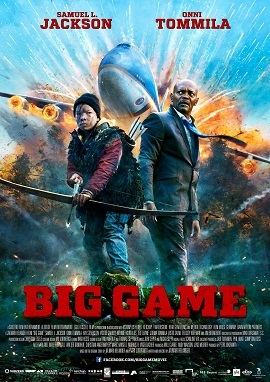 ‘Big Game’ is an entertaining throwback to the children’s action adventure films from the 1980’s, a Finnish production that casts Samuel L. Jackson in the role of the US president as terrorists try to take him out on a visit to Helsinki. When terrorists shoot Air Force One down, the President is forced to rely on help from a young Finnish boy called Oskari (Onni Tommila) to survive. Oskari was in the forest on a hunting mission to prove his manhood to his community, and the bizarre situation offers him a perfect situation to do just that. Tommila builds up a good rapport with Jackson and the script effortlessly brings Oskari’s mission and the President’s plight together. The film is an enjoyable romp, knows its limitations and runs with the ridiculous scenario. Jackson is entertaining as the President, and the hammy performances surrounding him from the likes of Ray Stevenson and Jim Broadbent fit well into the setting. If anything, the film perhaps could have been a little bit more ridiculous and fully embraced its B-movie genre trappings. The script contains a good use of humour that compliments the action and the hammy performances, and coming in at a runtime of under 90 minutes keeps the plot short and snappy and breezing along. In this style of film it feels a little rote to complain about plausibility but the final twist feels a bit unnecessary and underdeveloped in comparison to the rest of the movie. Overall, ‘Big Game’ is nothing special but it’s an ideal film to watch if you want some straightforward popcorn entertainment to turn your brain off too.